What’s the best way for America’s chief development agency to help other countries reach prosperity and democracy? Increasingly, it’s creating partnerships not just with other governments, but with the private sector too, says USAID Administrator Rajiv Shah in this week’s podcast. USAID is working with a host of companies, including Google, which does everything from “mapping Lahore communities to find and vaccinate young kids” to “helping to invest in entrepreneurs creating new businesses to tackle extreme poverty and make a living for themselves by using private means;” Cargill, which was able to “redirect a $7 million shipment of rice and put it quickly into the Somalian economy” to reach famine-affected areas; Wal-Mart, which is reaching “hundreds of thousands of small-scale farmers” with technical assistance and connecting them to a market that “is going to be there in the long haul and sustain their gains;” and GE, which is helping to bring power to hundreds of health clinics in East Africa. The first happened before the storm hit on November 8: the U.S. shared predictive and climate data that allowed the Philippine government to evacuate 700,000 people. “We all saw those early estimates of death toll being far higher than what people ultimately found was the consequence, and it’s in large part because in partnership we were able to get that done,” Shah says. And the answer to that question cannot only and just always be what our military is doing. It’s got to be more comprehensive in a manner that captures certainly our diplomatic and development efforts in government, but also captures the full range of American institutional partnerships around the world in business, science, innovation, and technology. 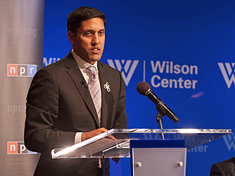 Rajiv Shah spoke at the Wilson Center on February 14 as part of the “National Conversation” series, co-sponsored by NPR.